Our Champion radiators come with a variety of options including the option for some radiators to be a single, double or even triple pass radiator. 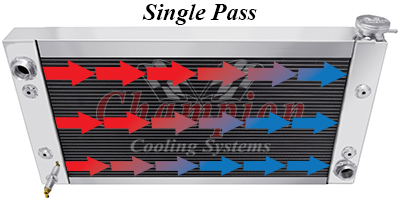 A single pass radiator is a radiator that flows one way, either from top to bottom or from side to side. 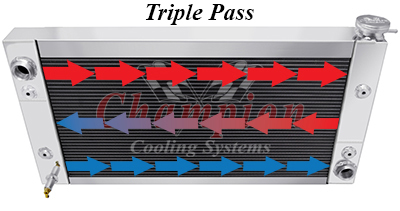 While a dual pass radiator flows from one side to other then turns and goes back to the other side. The added benefit of having multiple passes is that the coolant spends longer time exposed to the core which adds extra time for it to cool your engine even further. 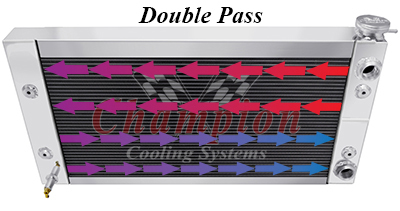 The popular application for our dual pass radiators are for enthusiasts with LS engine swaps. Although not all of them are designed for this exact purpose, the primary dual pass product line comes with an optional steam port to properly cool the high performance delivered by your LS motor.